Joey Evans' one-way ride takes him to the west coast; here it arrives at the Oakland Pier (aka Oakland Mole) train and ferry terminal which no longer exists, having been demolished in the 1960's to make way for the Port of Oakland's container ship facilities. It was located at the west end of 7th Street in Oakland (map). This movie preserves some rare video footage of the terminal. Then ... Joey nonchalantly carries his raincoat over his shoulder (that used to be cool) as he leads the passengers up the ramp to the San Francisco ferry. For another glimpse of this part of the terminal from a different movie (Sudden Fear) and for more on the location, go here. ... a vintage photo ... most likely from the 1940s or 50s. It shows the same Oakland pier clock , below, captured in the movie, above. At that time the San Francisco sign was mounted on the front of the balcony and there wasn't a Coca-Cola sign over the kiosk. Then ... Joey's ferry, the Berkeley, pulls out of the slip with Yerba Buena Island and the San Francisco - Oakland Bay Bridge ahead. San Francisco itself can be seen in the distance at far left. ... and Now, cranes have replaced trains in the same view below looking west from 7th Street across the port facilities that now occupy the terminal site. Then ... On the ferry Joey seems more interested in eyeing the pretty ladies (a recurring theme throughout the movie) than the fine view past the Bay Bridge to the hills of Marin County. Yerba Buena island is on the right and the Golden Gate bridge is in the upper left corner. ... and Now, the Oakland Pier is gone and the ferry now leaves from nearby Jack London Square but it plies the same route and enjoys the same view. Then ... The city draws closer with the clock tower of the Ferry Building, left of center, marking the ferry's destination. Dead center on the hilltop skyline are the Mark Hopkins and Fairmont Hotels. The Brocklebank Apartment building (featured in the movies Impact and Vertigo) is to their right. ... and Now, over sixty years later a thicket of Financial District highrises has transformed this same view. 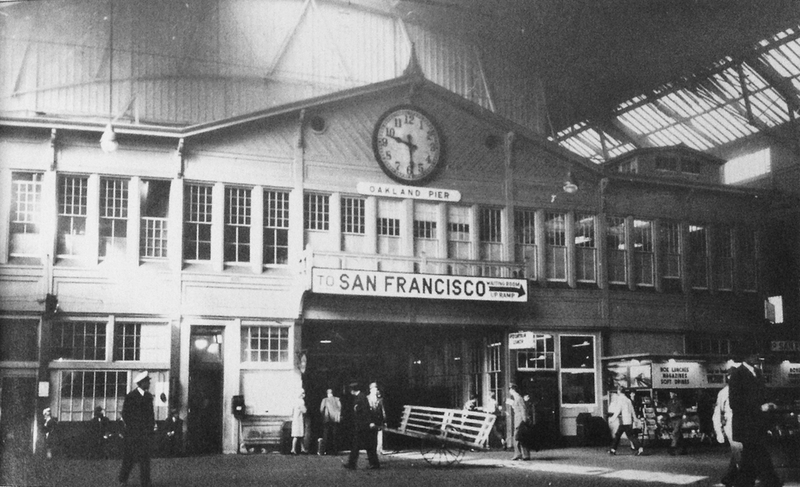 At its zenith in the 1930s the Ferry Building was the second busiest terminal in the world until the two new Bay Bridges brought on its decline. The busiest? ... Charing Cross Station in London. Then ... On arrival he passes through the Ferry Building's waiting room. ... and Now, the waiting room was at the south end of the second floor. In 2003 the Ferry Building reopened after a huge renovation, magnificently transformed from a decaying structure into a popular public space. That waiting area has been built into offices, preventing a matching shot. The photo below shows the offices (on the left) as viewed from the adjacent Grand Nave. "Can I give you aid, young man?" ... and Now, this was right next to the central exit (map)- the Embarcadero (the main waterfront road) is through the arches on the right. Then ... Passengers spill onto the Embarcadero as Joey keeps clear of the two cops. The Ensign Cafe across the way was on the corner of Market Street. ... and Now, the Embarcadero block housing the Ensign Cafe, Murray's Restaurant (also seen above) and numerous taverns was razed as part of the Embarcadero Redevelopment Project and is now an open plaza. A throwback to the past though, captured in the recent view below, is one of the wonderful fleet of vintage streetcars that ply Market Street and the Embarcadero daily.